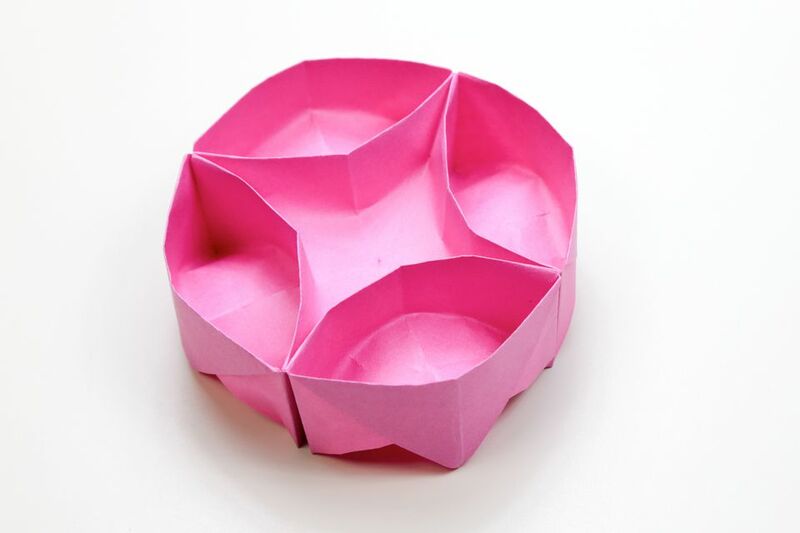 Learn how to make a round origami box with five sections inside, with these simple step by step instructions. This traditional origami model is the only box that ends up being round. This box would make a great snack bowl at a party, or a pretty box to keep jewelry in! For this tutorial you will need one sheet of square paper, about 20 x 20 cm and quite thin. 1. Fold in half diagonally both ways and unfold. 2. Flip the paper over and fold in half top to bottom, left to right and unfold. 3. Fold all four corners into the middle and rotate. 4. Flip the model over to the other side. 5. Fold the bottom edge up to the top, allowing the flap underneath to pop out. 6. Fold the little flap up to meet the middle. 7. Repeat on the top edge. 8. Unfold the top and bottom, rotate the paper and repeat the last 3 steps. 9. Pinch all four corners. 10. Carefully push in the center of the paper. 11. Completely squash the center. 12. Flatten the model out as shown. 13. Open the top flap a bit. 14. Push in the left and right corners to reverse fold them inside. 16. Repeat on the back. It's easier if you can find something round. You could use a cup, bowl or CD. 17. Use something round and place on top as shown, make sure the flaps are on the left. 18. Open out the top pocket with your left hand and trace around the round object to create a semi circle guide. Repeat on the other three sides. 19. Open out one pocket at a time and just the bottom inwards along the semi circle guide. 20. Keep straightening out the bottom. 21. After repeating on all 4 sections, straighten out the top of the box. 22. Now you can neaten up the bottom of the box. You should now have a pretty round origami box! Don't worry if yours looks wonky, practice makes perfect.